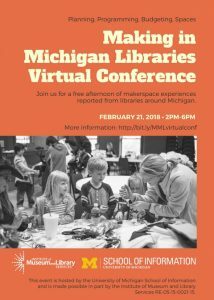 Ben and Kristin are presenting today at the Library 2.017 mini-conference on makerspaces. Here are the slides from Kristin’s portion of the opening panel on looking ahead to maximize community impact. Here are the slides from Ben’s presentation on envisioning libraries as hubs for craft businesspeople. Click http://bit.ly/Library2017Rearick to check them out! If you’d like to see our work in action, check out our Flickr page.